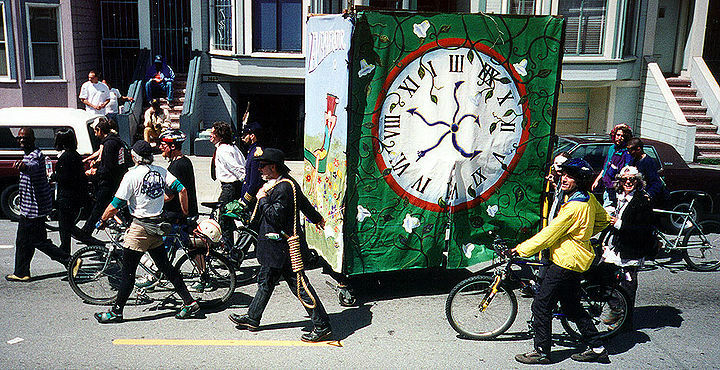 As an effort to resuscitate the long-dormant May Day workers' holiday a broad coalition came together in late winter 1998 to plan an extraordinary and unsanctioned day-long procession and carnivalesque event. "Reclaim May Day" was the result, held on May 2, 1998. "Shaking San Francisco" and their "Rememberator" on 18th Street, a central prop for their Dolores Park performance. 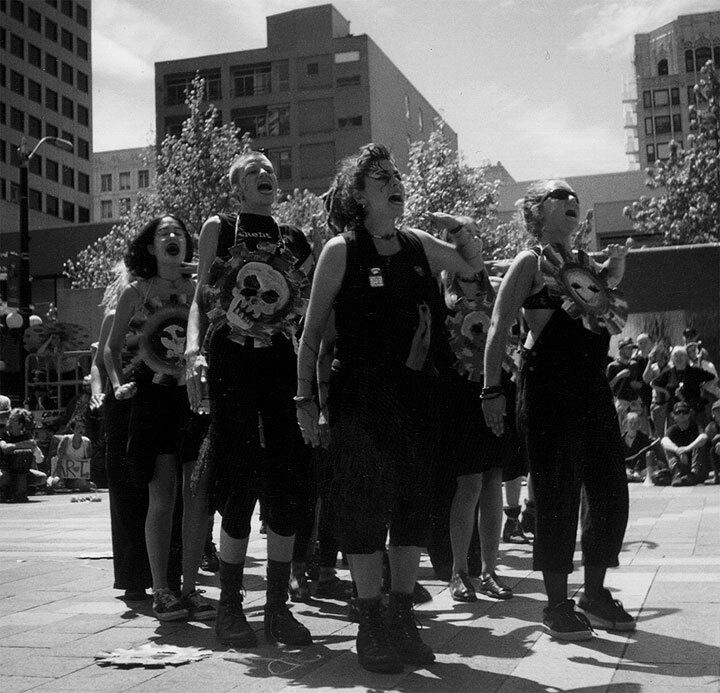 The Exotic Dancers Union at Justin Herman Plaza, Mayday 1998. Art and Revolution Convergence Collective in the streets. 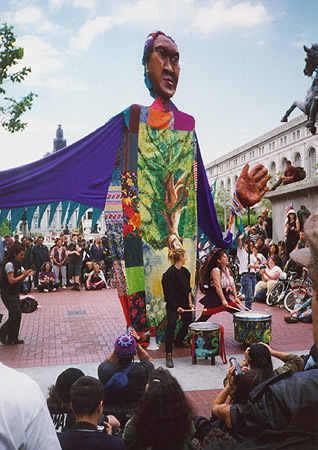 Wise Fool Puppet Theater, one of the performing participants in Reclaim May Day, 1998. 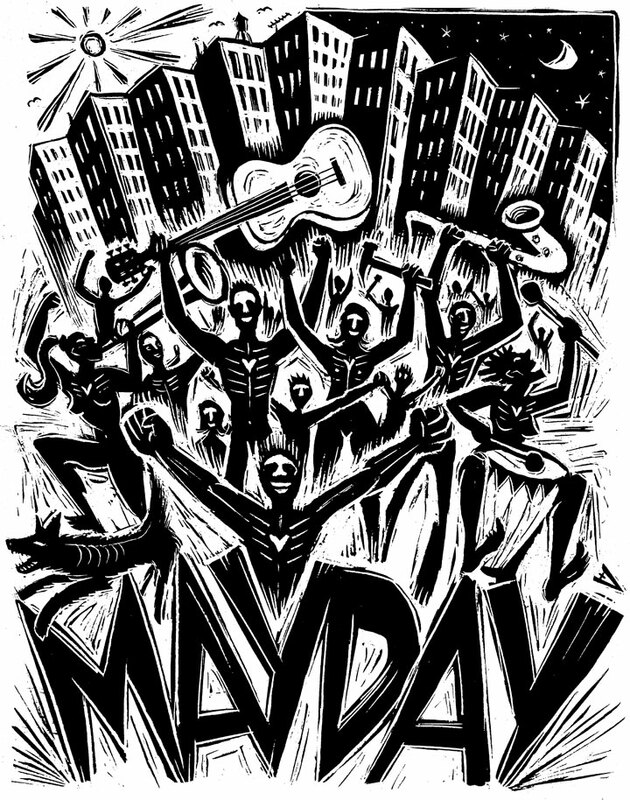 May Day is International Workers’ Day, a time of celebration and solidarity throughout the world, except in the United States where it began. May Day commemorates the 1886 nationwide movement of hundreds of thousands of working people who fought for the eight-hour day and much more. 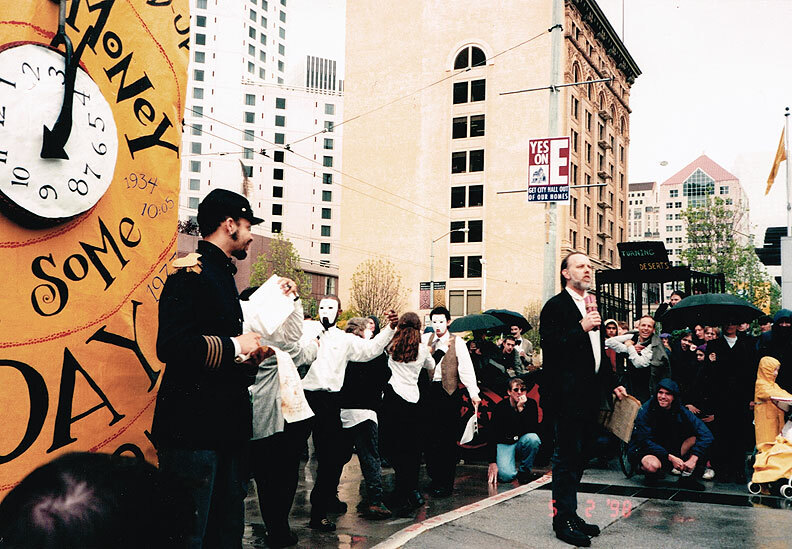 In 1998 hundreds of people gathered in the streets of San Francisco for a festive procession honoring May Day and celebrating the vibrant political passions of the time. The festival began near the foot of Market Street, where workers gathered in 1865 to start their Eight-Hour Day March. 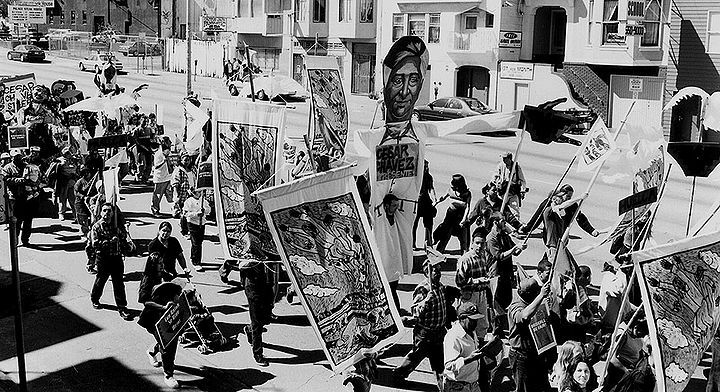 Here other events in San Francisco’s illustrious labor history occurred, from the 1916 bombing that led to labor radical Tom Mooney’s 23-year incarceration, to the 1934 General Strike, which was theatrically commemorated. A moving street party converged along the route at key sites. At these sites, both historical and current events were dramatically expressed by a wide range of arts/activist groups through theatre, performance, poetry, dance, music, giant puppets, a “bicycle ballet” and more. The journey through the city was assisted by the Mexican Bus, live music, and theatre antics. The procession stopped at Yerba Buena Gardens for skits and bagels, and then again at 569 Dolores Street to commemorate the house where Emma Goldman and Alexander Berkman published the radical journal The Blast in 1916. At Dolores Park, a 30-foot-tall May Pole dance ceremony was held, along with "The Rememberator" performance by "Shaking San Francisco," live music; a 120-foot-long graffiti mural wall; and SF’s biggest potluck picnic ever. 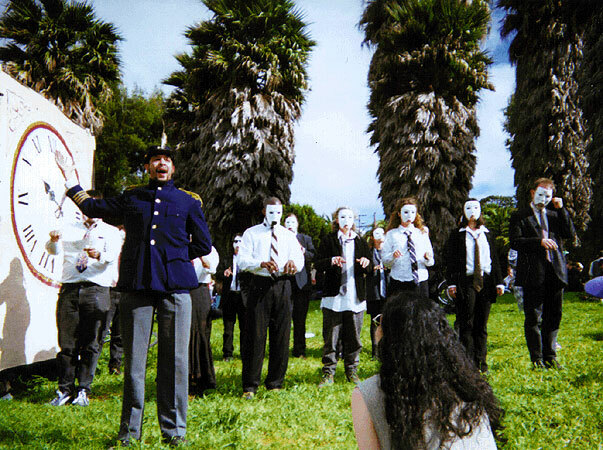 "The Rememberator" performance by 'Shaking San Francisco' in Dolores Park. Performance/participation included: San Francisco Mime Troupe, Shaping San Francisco, Art and Revolution Convergence Collective, Laney College Labor Studies Club, Comité Emiliano Zapata, United Farm Workers, Exotic Dancers Alliance, United Steelworkers of America, Roisin McAliskey Justice Campaign, Wise Fool Puppet Intervention, Freedom Song Network, Project Underground, Committee in Support of the People of Nigeria (CISPON), Clown Conspiracy, Girl Army, CISPES, Mission Agenda, Eviction Defense Network, 848 Community Art Space, Tribal Drums, Industrial Workers of the World, CellSpace, Reclaiming, Mexican Bus, SF Bicycle Ballet and more. Endorsed by People for Bread, Work and Justice. Co-sponsored in part by Network of Bay Area Worker Collectives and Rainbow Grocery. Maypole at Dolores Park, Reclaim MayDay, 1998. 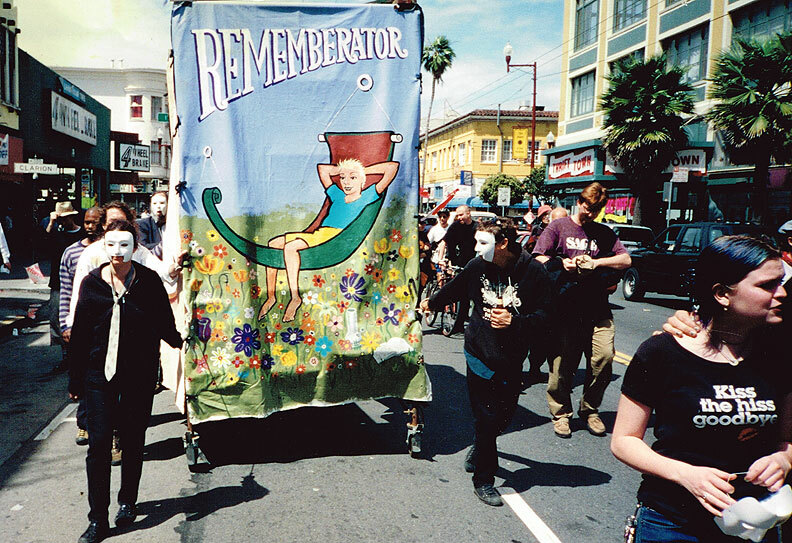 Rememberator performance underway, Moscone Center, May 2, 1998.